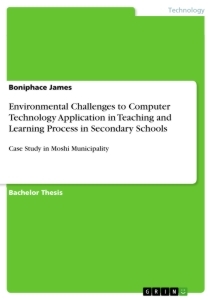 This study intended to investigate secondary school teachers’ knowledge and skills in presentation of lessons based on the proverb in secondary schools in Eldoret West District of Uasin Gishu County in Kenya. This was motivated with a trend of inability of the learners in English at national examination level to bring out clear answers in relation to questions set that relate to the proverb. This is because proverbs are tested in all the three English papers. The study sought to determine the role of the English teachers in description and mode of presentation of a proverb based lesson. This was with a view of improving performance in English in the integrated syllabus. The theoretical framework of the study was based on The “post modern” semiotic theory which presupposed that through the proverb, language learning should permeate all aspects of life. The research employed the descriptive survey research design. 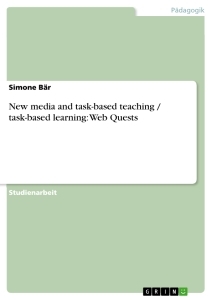 Questionnaires to teachers and Interview schedules were used in the collection of data. The findings of the study are significant to the curriculum developers and implementers especially English and literature teachers who are directly mandated with implementation of the integrated syllabus. It will also help to advice the teachers, school administrators, parents and the government on how children can develop in their life values as well as academic performance. Proverbs are an aspect of culture cherished all over the world and preserved in language which is the medium in which they are expressed. Proverbs have a psychological, philosophical, cosmological and socio-cultural orientation. The philosophical and didactive implications of proverbs makes them useful for teaching, especially language at any level of education. Olajide (2013), asserted that many factors, including teachers knowledge could affect the use of proverbs in the teaching – learning process. He reasoned that proverbs, being stably rooted in the world of the language learner, would motivate and stimulate him. However, he wondered how much knowledge of proverbs the teachers of English, particularly at the secondary school level possess to make them employ the forms rewardingly. 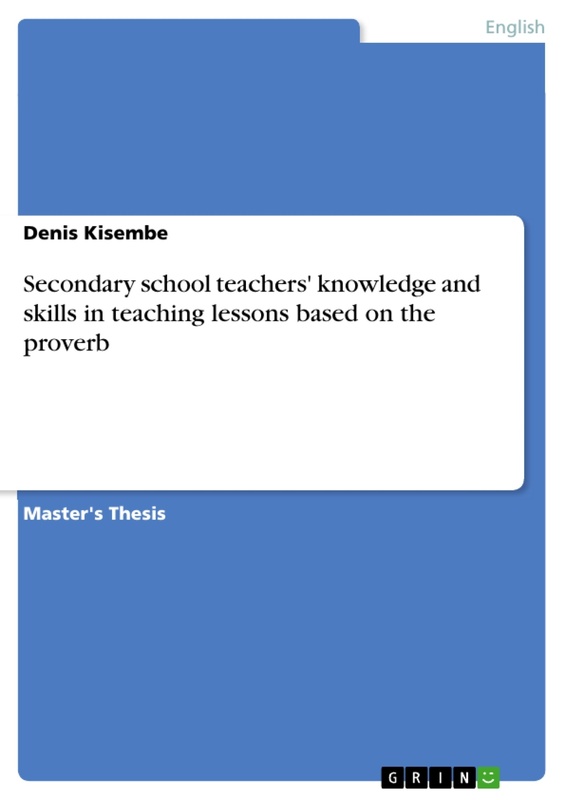 This study was carried out to find out if teachers of English in Kenya secondary schools possess the knowledge and skills of proverbs and their presentation in the classroom situation. In the quest to improve learner performance, teacher- learner strategies have to be employed. Lawal(1995) and Olajide (2006,2010) advocated for the use of proverbs in Language teaching and learning. They reasoned that proverbs, being stably rooted in the world of the language learner, would motivate and stimulate them. However Olajide wondered how much knowledge of proverbs the teachers of English, particularly at secondary school level possess to make them employ the forms rewardingly. According to Abimbola (2009), Knowledge and skill of the proverb in itself has an intricate nature. Its acquisition and dissemination cannot be haphazard. It can be weakened if not enhanced and updated. Obafemi, (2007). In a similar study, however, said that in spite of the dominance enjoyed by the language in the nation’s school system, performance in it has remained worrisomely poor. For the Kenyan teacher, the use of proverbs in the English lesson goes along with such factors as gender, qualification, working experience, access to relevant material and constant practice. 3 (c) The Novel Homestretch by Velma Pollard; Write a story to illustrate the truth of the statement “East or West, home is best.” (KNEC English pp 3, 2010). 1 (a) Write a story to illustrate the saying “People who live in glass houses should not throw stones.” (KNEC English pp 3, 2012). 1 (a) Write a story to illustrate the saying “A stitch in time saves nine.” (KNEC English pp 3, 2013). 1 (b) Write a story to illustrate the saying “Charity begins at home.” (KNEC English pp 3, 2014). According to Nandwa (1976), A proverb is a deductive statement that is current in tradition or as an epigram that says, “the wisdom of many and the wit of one”; that is a proverb teaches something yet still remains a tradition that is passed down the generations. She says that each generation learns something and the next generation still finds it useful. She views the proverb as a complete story because it sums up a story in one moral. a) Aesthetic function- the English teacher should build the aesthetic value of the proverb in relation to language learning. This will help the learner to accept the genre and the language as a whole. b) Reflective function- the proverb acts as a mirror through which society views itself as it conveys its wisdom. The language class hence mirrors its benefits in the performance. The learners should use the proverb to reflect value in life. c) Normative function- the proverb reminds people of the norms of the society and the mitigation of deviance. In the language class proverbs will build moral norms in the learner hence foster great living within the community. d) Summative function- the proverb sums up experiences in a succinct way and helps them to foster proper communication. The teaching of the proverb in secondary schools has suffered a drawback with the introduction of the integrated English syllabus. Wafula (2009), attempted to define integration as the fusion of knowledge from different disciplines … education that is organized in such a way that it cuts across subject matter lines, bringing together various aspects of the curriculum into meaningful association to focus upon broad areas of study. She states that integration assumes that English teachers have the mastery of language and a clear understanding of literature which may not be the case. Her findings showed that teachers were not adequately prepared to use the integrated approach and the time allocated for English and literature was not enough in the school time table. Wetende (2013), in justifying her study, said that continued poor performance in secondary school English paper two where oral literature is an integrated component has attracted concern from education stake holders. A lot has been said and written about language being a very important medium of communication. Proverbs are experiences, some of which have been learnt the hard way (Nyembezi, 1950). In a class room situation they reveal what the learners and the teacher a like go through and their outlook to life. Ellis and Tomlinson (1980) and Mwanzi (1986), point out that pupils accuracy in the use of English depends on their ability to assimilate and use different integrated structures if well taught. Does the secondary school English teacher have the mastery of knowledge and skills in presentation of lessons based on proverbs? The research was done basing on model theories that are founded on Education, schooling, cultural and instruction framework. In the 12th century, Mathieu de Vendome of Hungary (quoted by Bautier, (1984), wrote that, “a proverb is a phrase, accredited by custom, accepted by general opinion, expressing a truth that has been proved genuine.” Bartlett Jere Whiting (1932), said that a proverb is an expression which, owing its birth to the people, testifies its origin in form and phrase, expresses what is apparently a fundamental truth, that is a truism, in homely language, often adorned, however with alliteration and rhyme. He continues to say that it is usually short, but need not be; it is usually true but need not be. Some proverbs have literal meaning as they are stated. Other proverbs have figurative meaning which makes sense. According to Calvin’s Theory of Value, there is human value planted in learning and knowledge acquisition. Every human being has an innate pre deposition to learn. As per the theory, children need to access learning in all its value and aesthetic outfit. The proverb, if well taught, with the right knowledge and skills should add moral and academic value in the learner and improve their performance not only in writing but also in life. This is in whichever context it is presented, that is in and out of the class. The “post modem” semiotic theory, advanced in classical times, states that when reading into the poetic world of proverbs, you immediately encounter a strange new world that demands an orientation into a world that is different in form and function. Disjointed syntax, paucity of words and terse indirect language, all mark the invisible form of the artistic yet meaningful reality. Analyzing the theory in relation to the language of the proverb in written work, it should be realized that the proverb permeates all aspects of life and language learning even in their figurative form and musical symmetry and should be properly taught. Oba (2012), says the proverb has been and remains a most powerful and effective instrument for the transmission of culture, social morality, manners and ideas of a people from one generation to another. The reason behind the efficacy of the proverb is that it is an aphorism, a wise saying based upon people's experience, and is a reflection of the social values and sensibility of the people. This agrees with the two model theories advanced above. According to the research problem presented, there is a close relationship between the teaching of proverbs and their performance in the language class in any district and in any school in Kenya and the world over..
2. Find out the teachers description and mode of presentation of a proverb based lesson. The study was conducted in Eldoret West District Uasin Gishu County, Republic of Kenya. The use of both the qualitative and quantitative methodologies were employed to encompass the different aspects of social science in the area of classroom instruction. Quantitative data was collected using questionnaires while qualitative data is collected using interview schedules. The research study employed a descriptive survey design as the study sought to establish the current knowledge and skills of the English teachers in presenting lessons based on proverbs in secondary schools in the large population of schools from two education division in the study area. In this study questionnaires and interview schedules were developed by the research and used to collect data. A questionnaire was developed for the English teachers based on the objectives of the study above. An interview schedule is a set of questions that interviewers asks when interviewing for this paper the questions were based on the study objectives. An observation checklist was prepared for use to assess the mode of lesson presentation used by the English teacher. It was to be used to assess the learners responsiveness to the lessons. Table 4.7 If the respondent taught the proverb as part of their English lesson. From table 4.7 above, It was apparent that majority of the teachers taught the proverb as part of their English lessons as represented by 94.23% of the respondents while 5.77% responded that they did not teach the proverb as part of their English lessons. From table 4.8 above, It was apparent that majority of the teachers handled proverb related lessons on a monthly basis as represented by 42% of the respondents. 32% responded that they handled the lessons on a weekly basis while only 20% responded to handling the proverb related lesson on a weekly basis. None of the respondents handled the proverb related lesson on a daily basis. Difficult in presenting the requirements of a proverb in a lesson. Chart 4.3 Difficult in presenting the requirements of a proverb in a lesson. From Chart 4.3 above, it was apparent that most of the teachers did not find it difficult to present the requirements of a proverb in a lesson. This was as represented by 34.04% of the teachers who strongly disagreed to the statement with 31.91% who disagreed. 29.79% agreed together with 2.12% who disagreed. 2.12% were undecided. Whether the contents of a proverb are clear to the teacher. Chart 4.4 If the contents of a proverb are clear to the teachers. From Chart 4.4 above, it was apparent that most of the teachers found the contents of a proverb clear to them. This was as represented by 42.55% of the teachers who strongly disagreed to the statement that the contents of a proverb were not clear to them with 42.55% who disagreed. 10.64% agreed while 4.26% were undecided. Difficulty in understanding the language of the proverb. Chart 4.6 Difficulty in understanding the language of the proverb. From Chart 4.6 above, it was apparent that most of the teachers found no difficulty in understanding the language of the proverb. This was as represented by 40.43% of the teachers who strongly disagreed to the statement that they found it difficult to understand the language of the proverb together with 38.3% who disagreed. 8.51% agreed to the statement while 8.51% strongly agreed. 4.26 were undecided. If the requirements of a proverb in paper One Two and Three are not clear.. Chart 4.7 If the requirements of a proverb in paper One Two and Three are clear. From Chart 4.7 above, it was apparent that most of the teachers were clear with the requirements of paper one, two and three. This was as represented by 17.02% of the teachers who strongly disagreed to the statement that the requirements of the proverb in the three papers were not clear with 38.3% who disagreed. 25.53% agreed to the statement while 12.77% strongly agreed. 6.38% were undecided. SECTION D: MODE OF PRESENTATION OF A PROVERB BASED LESSONS. This section asked questions on the respondents mode of presentation of a proverb based lesson and the findings were as presented below. If the teachers prepare thoroughly for the lesson. Table 4.9 If the teachers prepare thoroughly for the lesson. From table 4.9 above, it was apparent that most of the teachers prepare thoroughly for the lesson. This was as represented by 51.06% of the teachers who agreed to the statement that they prepare thoroughly for the lesson with 25.54% who strongly agreed. 17.02% disagreed to the statement while 6.38% strongly disagreed. Chart 4.9 Difficult in relating the proverb to other aspects of English. From Chart 4.9 above, it was apparent that most of the teachers did not find difficulty in relating the proverb to other aspects of English. This was as represented by 48.08% of the teachers who disagreed to the statement that they found difficulty in relating the proverb to other aspects of English preferred to teach literature aspects with 7.69% who strongly disagreed. 25% agreed while 17.31% strongly agreed. Only 1.92% remained undecided. If integrating literature and language is a challenge. From Chart 4.10 above, it was apparent that most of the teachers found it challenging to integrate English and Literature. This was as represented by 55.77% of the teachers who agreed to the statement that they found integrating literature and language a challenge with 11.54% who strongly agreed. 15.38% disagreed while 13.46% strongly disagreed. Only 3.85% remained undecided. Teachers should be in-serviced on teaching the proverb based lesson. Table 4.19 Teachers should be in-serviced on teaching the proverb based lesson. From table 4.19 above, it was apparent from most of the respondents that teachers should be in-serviced on teaching the proverb based lesson. This was as represented by 44.23% of the teachers who agreed to the statement that teachers should be in-serviced on teaching the proverb based lesson with 48.08% who strongly agreed. 3.85% disagreed while only 3.85% strongly disagreed. The overriding purpose of this study was to assess the teacher’s knowledge and skills in presentation of lessons based on proverbs in Eldoret Wesr secondary schools. There is little known about the teaching of proverb in our secondary schools. According to Olajide (2013), many factors, including the teachers knowledge could affect the use of proverbs in the teaching and learning process. This study was carried out with the aim of improving lesson presentation. This would go a long way in improving learners’ performance in the national examinations. Secondary school English teachers knowledge of the proverb. The first objective sought to find out the secondary school English teachers knowledge of the proverb. From the findings in, it was apparent that majority of the teachers taught literature as part of their English lessons. The teachers were found to have had the requisite skills to handle the proverb lesson as required by the syllabus. The teachers also responded that they taught the proverb in their literature lessons. However, majority of the teachers handled proverb related lessons on a monthly basis as opposed to others who handled it on a weekly basis. This shows that the frequency with which the genre was handled was not sufficient enough. Olajide (2013), asserts that many factors, including teachers knowledge could affect the use of proverbs in the teaching – learning process. He reasoned that proverbs, being stably rooted in the world of the language learner, would motivate and stimulate him. However, he wondered how much knowledge of proverbs the teachers of English, particularly at the secondary school level possess to make them employ the forms frequently and rewardingly. The findings also showed that most of the teachers put less emphasis on teaching literature topics in the English class. The teachers however did not find it difficult to present the requirements of a proverb in a lesson. They however failed in laying more emphasis on the teaching of the genre. Most of the teachers found the contents of a proverb clear to them. The teachers also found no difficulty in defining the proverb and also found no difficulty in understanding the language of the proverb. The findings showed that most of the teachers were clear with the requirements of the proverb in paper one, two and three and therefore could properly handle examination tasks with students. This would help improve learner performance in national examinations. It agrees with Lawal(1995), who asserted that in the quest to improve learner performance, teacher- learner strategies have to be employed through knowledge and experience. From the personal comments on the ability of the secondary school English teacher to bring out the proverb based lesson, the teachers’ comments and suggestions showed that the teachers are able to deliver the message as required by the proverb lesson. They also said that presenting the proverb based lesson is challenging but it is possible. Teachers are competent enough to handle the lesson and their ability is sufficient if well facilitated. Teachers should increase the use of the proverb in their day to day communication. Most aspects of the proverb are overlooked by many teachers. This contributed to less content delivery during the lesson. Amidst the many challenges, teachers suggested that they should think outside the box and do what is in their ability to improve the proverb based lesson and their own delivery skills. According to Abimbola (2009), Knowledge and skill of the proverb in itself has an intricate nature. Its acquisition and dissemination cannot be haphazard. It can be weakened if not enhanced and updated. From the interview schedule, the responses showed that Teachers should be given further in-service training on the preparation of literature based lessons. From interview S11, there should be more training given to the teachers on the aspects of integration and emphasis put on the teaching of proverbs and other short forms in oral literature as it would help improve the teaching. From the findings shown on the secondary school English teachers knowledge of the proverb, it was clear that the teachers had the requisite knowledge and experience to handle lessons based on the proverb. The teachers description and mode of presentation of a proverb based lesson. The second objective sought to find out the teachers description and mode of presentation of a proverb based lesson. From the findings it was apparent that most of the teachers prepare thoroughly for the lessons. However, most of the teachers did not use visual aids in their lesson presentation. It was also apparent that most of the teachers use learner participation in lesson presentation. This agrees with Barasa (2005), who asserted that the teachers trained have the literary skills and are least interested in this aspect of English are likely to give a weak presentation. Also the findings showed that most of the teachers did not use resource persons when presenting proverb based lessons. The teachers also did not use team teaching when presenting the proverb based lesson. It was clear from the findings that most of the teachers use the Question and Answer method in presenting proverb lessons. It was also clear that most of the teachers use the text book and other written books. Bronwell and Eison (1991), asserted that students on their part fail in their quest to get the right thing and need to be guided in the language learning class, in relevance to the short form genres of oral literature. This will help them to explore the creative images in the piece. This is not being accomplished as the teaching tends to lack motivation that is relevant to guide the learners through. Due to the nature of the education system, field work is minimal as well as practical work. These are in part due to the urgency to cover the many topics in the syllabus. Most of the teachers did not give lots of class exercises based on the proverb. From the teachers personal comments on description and lesson presentation, the teachers said that presenting the proverb based lesson is challenging but it is possible. Teachers are competent enough to handle the lesson and their ability is sufficient if well facilitated. Time factor has remained a challenged as there has not been enough time allocated the proverb and other literature aspects in the integrated syllabus. Wafula (2009), observed that negative attitude of teachers and learners are challenges that impede success of integration in most secondary schools. Teachers should ensure full learner participation for greater learner fulfillment. They should also improve the context in which the proverb lesson is presented so that it is not given in isolation. Teachers should increase the use of the proverb in their day to day communication. Amidst the many challenges, teachers said they had the ability to improve the presentation of the proverb based lesson. This agrees with Adeyemi (2010) who asserted that the trend is rapidly changing because teachers and researchers are today arguing for the use of more than one discipline to teach or clarify a concept or an issue by bringing forth the relationship and the contribution of various disciplines and varied resource persons for a better understanding of the topic, theme or the content under study. From the interview schedule, the responses showed on the teaching methods use in presenting the proverb based lesson, all the teachers agreed that they used the lecture method and student participation especially in the giving of examples. Others said that they used the ‘question and answer’ method but ensured that the lesson was learner centered. The teachers also used the class discussion method when teaching the proverb lesson. They then allowed the learners to give a presentation of the discussion. One of the teachers said that he used the written books and short stories in teaching the proverb lesson. On the learner response to the proverb lesson, most of the respondents said that it was fair while others said that it was good. According to the teachers, the learners got excited with the lesson. This argument is supported by Brown (2001) as quoted in Pekoz (2008) who asserts that learners of English language should not be overwhelmed with linguistic terminology and that topics should be taught in digestible segments bearing in mind the cognitive process of the mind. Teachers should accord learners an open field of participation for better understanding of the proverb lesson. Farrel and Particia (2005) support the idea of explaining rules to the learners because if they have the ability to apply the rules, it would translate into fewer errors in their speech and in writing. Analysis of teachers’ presentation skills in a proverb based lesson. The third objective sought to analyze the teachers’ presentation skills in a proverb based lesson and how they could improve on the same. The findings showed that teachers should be in-serviced on the aspects of integration in the English syllabus as this would help improve their presentation skills. Teachers should also be in-serviced on teaching the proverb based lesson. It was apparently clear from most of the respondents that there should be improvement in the production of learning resources on proverbs to aid the teachers I their lesson presentation. The findings also showed that there are few teacher learner resources on the proverb in the market. From most of the respondents it was clear that more lessons should be allocated literature aspects like the proverb. From the personal comments given by the respondents, the teachers are able to deliver the message of the lesson if sensitized. The teachers should be in-serviced on proverb lessons. Poor in-service facilities greatly challenge effective lesson delivery. Teachers should be supported fully in the integration of proverb based lessons in secondary schools. More written work and resources on the proverb and related features should be produced as it will make the proverb lesson enjoyable and easy to handle. The written work produced should be adequate, relevant and come from variety of languages for effective delivery. This would aid the teacher in correct lesson delivery. Presenting the proverb based lesson is challenging but it is possible. Teachers are competent enough to handle the lesson and their ability is sufficient if well facilitated. Teachers should increase the use of the proverb in their day to day communication. Most aspects of the proverb are overlooked by many teachers. This contributes to less content delivery during the lesson. From the interview schedule on the frequency with which the teachers taught the proverb, the teachers responded that it was circumstantial and taught it when teaching other language aspects like composition. On the learner response to the proverb lesson, most of the respondents said that it was fair while others said that it was good. According to the teachers, the learners got excited with the lesson. On the efficiency of teacher learner resources, all the teachers said that the resources, though available, were not enough. There was need to make more resources available to help in teaching proverb related lessons. The use of proverbs in integration. The fourth objective sought to determine the use of the proverb in integration and the findings showed that the integration process was a challenge. It was apparent that most of the teachers preferred to teach literature aspects separately. This failed to agree with Okwara and Shiundu (2009) who supported the view that integrated language teaching promotes the learning of real content and is highly motivating to learners because that is how language occurs in real life. Therefore, teaching literature and grammar in context is extremely important and must not be ignored by teachers. The findings showed that the teachers did not find difficulty in relating the proverb to other aspects of English. The KIE syllabus (2006) stated that through exposure to literature the learner will improve their language skills. It was apparent that most of the teachers found it challenging to integrate English and Literature. They also said that there was scarcity of teacher learner resources on integration. The teachers had also not been properly in-serviced on the integrated English syllabus. These assertions agree with the findings of Wafula (2009), and Adeyemi (2010), who said that an integrated approach to learning attempts to follow the child’s natural ways of learning, viewing the world as a whole, the teacher’s role being to provide experiences and to assist the process by suggesting further lines that may be followed. They observed that negative attitude of teachers and learners are challenges that impede success of integration in most secondary schools. Most teachers prefer using narratives in the teaching of grammar as opposed to other genres, which means that other oral literature genres like songs, proverbs, tongue twisters and riddles are yet to be fully exploited in the teaching of grammar. More should be written on teaching the proverb in the English class. Also, examination questions in the three English papers challenge the learner because of integration and the proverb is considered subordinate to other topics in the English syllabus. On suggestions of improvement teachers should be in-serviced on the aspects of integration in the English syllabus. Also more lessons should be allocated literature aspects like the proverb and that Literature should be taught as a separate entity as before. This agrees with Carter (1982), who suggests that literature and language are distinct subjects of study and they have intrinsic value for the learner and teacher and ought to be treated independently. From personal comments Teachers should be supported fully in the integration of proverb based lessons in secondary schools. The research was done basing on model theories that are founded on Education, schooling, cultural and instruction framework. According to Calvin’s Theory of Value, there is human value planted in learning and knowledge acquisition. The proverb, if well taught, will add moral and academic value in the learner and improve their performance not only in writing and examinations but also in life. This is in whichever context it is presented in and out of the class. Realizing that the proverb permeates all aspects of life and language learning even in their figurative form and musical symmetry, should be properly taught according to the “post modem” semiotic theory, advanced in classical times. There is a positive contribution by the teachers in the teaching of proverbs in English in our secondary school syllabus. This was shown by the teachers aptitude in teaching the requirements of the syllabus. In this case the teachers had the requisite knowledge and skills to teach the proverb in secondary schools as the integrated English syllabus requires. Though there are many challenges, the teachers teach as the curriculum requires. They however needed more practice, training and in service courses on the proverb and the integrated English syllabus. This will allow them to be vast in the knowledge and skills needed to effectively teach the proverb in the secondary school class. The proverb is a good teaching tool for morals and a value builder in life. It should be therefore used more in spoken and written work. The teachers should therefore strive to acquire the relevant knowledge and skills needed to effectively present a proverb based lesson. - The teachers should be in-serviced on proverb lesson. Poor in-service facilities greatly challenge effective lesson delivery. - Teachers should be supported fully in the integration of proverb based lessons in secondary schools. - The designers of the syllabus should consider literature entities with greater importance and allocate more time more of the sub-topics across from form one to form four so as to give them the emphasis they deserve. - Review the integrated syllabus and separate Literature from grammar so that they are taught separately as it was in the past so as to improve lesson delivery. - Teachers should increase the use of the proverb in their day to day communication. The researcher recommends further studies in this topic area. More books, novels, journals and related documents need to be written and studied on the proverb and how teachers can improve in knowledge and skills in presentation of lessons based on the proverb in our schools. Adeyemi,L. (2006). Will the real national literature for Nigeria please stand up? Paper presented to the 23rd Annual conference of the Nigerian English studies Association. (NESA). Held at university of Ilorin, October 31- Nov 4th 2006. Ellis, R. Tomlinson, B. (1980), Teaching secondary English Essex: longman group ltd.
Lawal, A. (2005). Globalization, education and development in Africa: the bedeviling dilemmas, paper presented on the theme “Challenges of Education in the 21st century” at the Moi University 1st Annual conference, Moi University. Eldoret, Kenya (14th -16th February 2005). Lawal, A. Ajayi, B. Raji. W. (1995). A pragmatic study of selected pairs of Yoruba proverbs, Journal of Pragmatics,635-652. Miruka, O. (1999), Studying Oral Literature . Acacia Publishers, Nairobi. Nandwa, J.A. (1976), Oral literature among the Abaluyia, Unpublished Master of Art thesis submitted to the University of Nairobi, Nairobi. Nyambezi, C.L.S (1950), Zulu Proverbs. Johannesburg. Olajide, S.B. (2013). AN assessment of secondary school teachers knowledge of proverb in Ilorin, Kwara State, Nigeria. Mediterenian Journal of social science e.g. MCSER Publishing, Rome –Itely, Vol4 no3.